The surprise summer movie hit My Big Fat Greek Wedding tells the story of Toula--a frumpy, old-maid-at-thirty Greek-American woman determined to change her life. To her family, she is this close to being a lost cause. Her father plots to send her away to Greece in an attempt to conceal her true age and marry her off to an unsuspecting Greek, but tells her younger brother he has plenty of time to find a wife. Her "breeder of Greek eaters" sister bullies her from the pulpit of motherhood. But Toula's mother unexpectedly backs her plan to take some classes at the community college. Toula is astounded that her mom would defy the head of the house. "The men may be the head of the house," Mom tartly replies, "but the women are the neck and they can turn the head anyway they want." Toula makes herself over, a process that involves a change of wardrobe, a girdle, and lots of plucking. In her new school incarnation, she banishes the ghost of the "swarthy six year old with sideburns" that haunts her elementary school memories, ditches the homemade lunches of moussaka, and ingratiates herself with the blondest, WASPy-est girls in the student union. Emboldened by her success on campus, she dares flirt with a dreamboat schoolteacher she first glimpsed whilst working in her family's restaurant. Eventually, Toula's family becomes aware of her affair; and she is delighted to discover her boyfriend, Ian, is able to withstand their scrutiny. Thus, having forayed into the bland, white bread and bundt cakes world of middle America--and nabbing a native for a fiancee--Toula begins phase two of her transformation. In this part of the movie, Toula re-claims, or rather, is re-claimed by her culture. The preparations for Toula's big, fat, Greek wedding are entirely co-opted by her family, from the venue to the Greek flagged invitations that misidentify her future mother-in-law as "Harry." On the eve of her wedding, Toula's crazy (and that's not crazy like eccentric or wacky, but crazy like insane) grandmother places a nuptial crown of twigs and faded blossoms upon the bride-to-be's head. Together, Toula, her mother, and her grandmother admire the effect in a mirror, forming a pretty tableau of Grecian womanhood, and foretelling ToulaÕs future. It's a bit surprising to see Toula submit to her Greek-American heritage after all her griping about it; but then she goes on to convert Ian's clan. This isn't a bad thing. If you have Greek-American associations, you will know that they can be a real blessing in your life. On the other hand, Ian's pallid ethnicity--whatever it is--seems a curse. His parent's house is impeccable, silent, and cold, as are his parents. His (only?) friend is bent and acerbic, and keeps trying to fix Ian up with interchangeable twinkies. Ian himself is a vegetarian, a concept his future in-laws cannot get their minds around. "I'll make lamb," his aunt-to-be volunteers. In the end, after multiple shots of ouzo, everybody is one big fat happy family. For instance, Ian's mom seems to have become reconciled to being known as Harry, and his friend is caught eyeing a bridesmaid. Her father presents the happy couple with the deed to a house, and everybody dances. Opa! Opa! The moral of this story is clear: conform. My Big Fat Greek Wedding stands in warm contrast to the last batch of films I wrote about, in which unusual, unwise, or non-conformist characters are ground into powder by the larger society. (Those movies, by the way, are AI: Artificial Intelligence, Cast Away, The House of Mirth, Ghost World, Mulholland Drive, and Angel Eyes, and the article in question can be found here). Toula wanted to change her life, and she did, radically. But what she changed it into was not radical at all. Sure, she took an unusual route. The women in her family did not enroll in college--but let's face it, if your mom signs onto a plan, how likely is it to rock the boat? She gets a different job, switching from seating hostess at the family restaurant to travel agent--but the agency is also a family business, owned by her aunt. She is affianced to a non-Greek, an unheard of thing to do--but then he converts and is baptized into the Greek Orthodox Church. Then she marries him and lives happily ever after, right next door to her parents, breeding Greek eaters. MBFGW has been called a Cinderella story, both in terms of its plot and its popular triumph. To take the last part first, the most recent tally I read put its grosses at about $45 million dollars. This doesn't seem like much of a bonanza compared to the likes of Spider-Man's $114 million opening weekend take, but since MBFGW only cost about $3 million to produce, it has been spectacularly successful on it own terms. The making of the film has a mini-legend behind it. 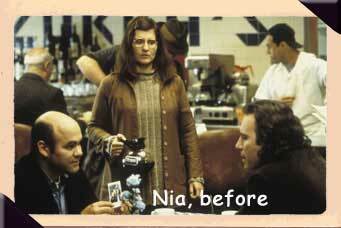 The movie is based on a one-woman play by Nia Vardalos, who reportedly based the story on her own life. The play was seen by Rita Wilson, who in the role of Fairy Godmother, instigated film production. 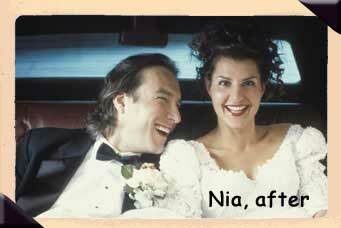 Wilson even insisted that the relatively unknown and un-lithe Vardalos star as Toula. The official reason behind Wilson's attraction to the play is her own Greek-American heritage, but it's hard to ignore her role as consort to one of the biggest movie stars of our age--Tom Hanks, purported embodiment of the decent, normal, average American. Plotwise, there is a Cinderella resonance in the narrative arc of a serving drudge who becomes a lovely married woman. But where Cinderella got a leg up from a supernatural being and was elevated to an exceptional position, Toula tapped inner resources that enabled her to become a fairly typical denizen of her community. So rather than the Cinderella message of patient goodness finally, fabulously paying off, Wedding is an ode to culturalization. Listen, I'm not knocking it. Things do tend to go better if you're pretty (see the before and after photos) and socially acceptable. If the prevailing group eats sandwiches instead of something that sounds like "moose ka-ka," get yourself a sandwich. Likewise, if you are part of the colorless friends and family of the groom section (and outnumbered twenty-to-one by festive ethnic types), best to drink the wine and join the party. In any case, schmooze like crazy and maybe you will be granted a place at the cool kid's table. That's why the naming-renaming motif is so interesting. First, there is the Harriet/Harry business of the invitations, which Toula's family (initially) and Ian's family (finally) thinks is no big deal. The name "Toula" is actually a diminution of her proper first name, Fotoula. In marriage, she takes Ian's surname, Miller. In his wedding toast, Toula's father stretches to make a connection between the name Miller and the Greek word for apple. His family name, Portokalos, means "orange" in Greek, and so he says, the families are not so different--they are, in fact, all fruit. In short, personal identity comes in a distant second to membership in a group.